"Leicester - a great story but they'll never keep this up over the course of a whole season." The suspicion has lingered throughout this campaign that the Foxes' remarkable run cannot be sustained over the course of a 38-game Premier League season. But the evidence suggests otherwise. It is now 38 matches - nine last season and 29 this - since then bottom-of-the-table Leicester ended a sequence of five defeats and two draws with a 2-1 home victory over West Ham on 4 April. They have not looked back since, winning 24 of those 38 fixtures. 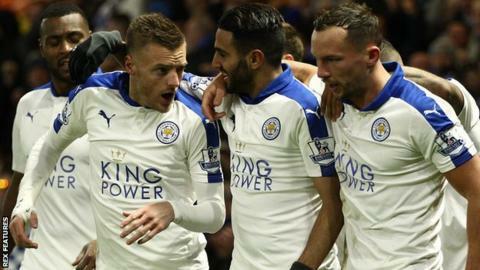 Of their previous 29 top-flight games after earning promotion in 2014, they had won just four. So how does the Premier League top 10 look over that 38-game period? Leicester, five points clear in this season's real standings, find themselves even further ahead at the top of the table, with an 11-point lead over Manchester City. And what about the bottom of the table? Aston Villa, Newcastle and Sunderland are a long away adrift. Note: Tables only include teams who played in the Premier League in both the 2014-15 and 2015-16 seasons.